Since I retired, there are very few things that will get me up at 7:00 a.m., let alone drive almost 200 miles (round trip) into the desert. The promise of a craft day with Vickie and Ellen is close to the top of the list (we missed you Nona!) 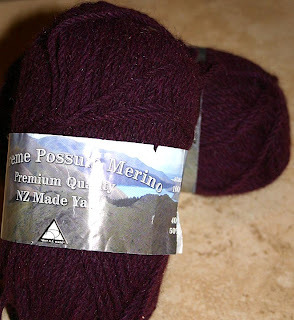 Just to make sure I didn't fall back asleep, Vickie sweetened the pot with this - 100 grams of Supreme Possum Merino yarn from New Zealand, in purple of course. (The NZ version is different from the N. American creature. Thank goodness.) This stuff is yummy - so soft and thick. Can't wait to make something with it. 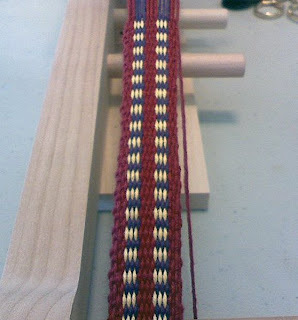 My first band, which I started in class at the Riverside weaving conference, came off the big inkle loom last night. 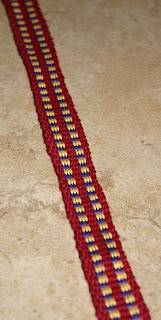 Also made with 8/4 carpet warp, this one is about 2 yards long. I have no idea what I'm going to do with these, other than take them to Guild for show-and-tell. But they sure are fun to make. The bands are great for all kinds of things. Guitar straps, handles for tote bags. 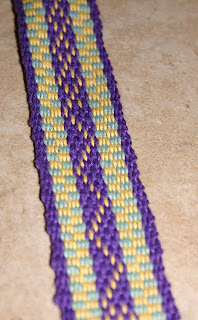 Sew a bunch together and make a vest, bands for a sweater or hand woven shawl border. 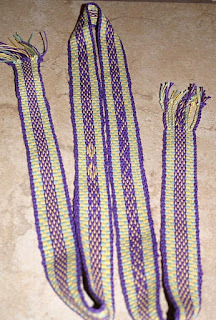 Stitch them together to make a cell phone case or purse, or check book. The possibilities are on going. It's a great portable project. 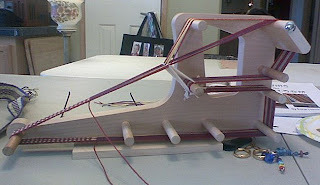 I take my inkle loom outside in the summer and to the park and so many other places.